Brynley Toms and his Bedwas Rugby teammates gave their survival hopes a huge boost with a complete team performance from 1 to 15 as they thrashed local rivals Bargoed 52 – 7 to earn a bonus point win. On a windy evening punctuated with heavy showers Bedwas kicked off in to the strong wind but started at a fast tempo registering the first try of the evening after only four minutes. Fly half Jacob Chilcott ghosting past a defender to set up Adam Williams to crash over for a Try. Joseph Scrivens added the extras, no mean task against such a strong wind. Scrivens added a penalty goal as Bedwas continued to dominate. Toms increased the Bedwas lead after 20 minutes as he used his size to bulldoze over the line, Scrivens again converted to make it 17 – 0. Bargoed hit back with a Try against the run of play as a Chilcott clearance kick was charged down and Bargoed full back Julian Mogg was adjudged the winner of the race to dot the ball down, Callum Jones successfully converted to pull them within ten. Replacement Jonathan Davies was next over the white line as Bedwas put the game to bed with 30 minutes left to play, Scrivens again converting. 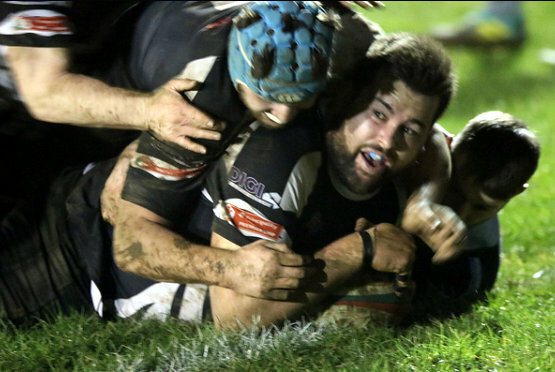 Bargoed secured some territory but could not penetrate a well-organized defense and Bedwas increased their lead on 68 minutes courtesy of a second penalty Try as again the Bedwas forwards outmuscled their opponents. Bedwas wrapped up proceedings in the final minute as Lewis Bowden intercepted a tired pass on the visitors try line. Scrivens’ conversion completed the scoring.